Major Carter joins an alien pilot for a space race, but the rest of the team discovers that on this world there is more at stake than the finish line. 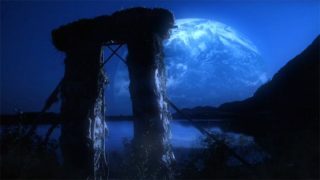 Especially when contrasted with the last few episodes this season, "Space Race" succeeds in illustrating three things quite well: the breadth of stories that Stargate is able to tell, the incredible talent of the visual effects crew, and the ability of our characters to grow and change when the writers really want them to. Well, there was no threat, at least not on the surface of things. That's one thing that makes this episode so different. For more than six years these characters have dealt with risks as they came, sometimes putting themselves in jeopardy, but usually only for the greater good. In "Space Race," we see Sam willing to put her life on the line -- for the thrill of it, for fun (which she admits when Daniel questions her motives). While on the surface this might seem foolhardy and uncharacteristic of Major Carter, Warrick reminds us that we on Earth have our fair share of life-threatening entertainment. Conveniently enough, we are reminded in the first scene that Sam herself could be viewed as an adrenaline junkie in her own right; she has a penchant for "wormhole theory, motorcycle riding and lock-picking," to quote "Nightwalkers." It seems that she has added on to her estimation of what is "fun" since her science project from "The Curse" (a motorcycle). And while in previous seasons Sam was arguably more of a stickler to the rules than her commanding officer, even that is going through a transformation. What isn't arguable is how impressive the visual effects of Stargate truly are, and "Space Race" highlights this. Your humble reviewer watched the episode a second time with family members -- one Star Trek aficionado and one science fiction Philistine -- and both commented on how motion-picture worthy the space scenes and the external shots of the city are. Score another win for effects supervisor James Tichenor and his crew. Score one for actor Christopher Judge as well. One of the gems of the episode was the scene in which Teal'c expresses his desire to avoid the diplomatic talks ... with characteristic subtlety. This actor can express volumes with a simple "indeed" and the particular angle of his eyebrows. It was also refreshing to see the writers coming up with an excuse to keep Teal'c around ... instead of an excuse to get rid of him. While "Space Race" was doubtlessly focused on Sam more than any other major character, and while most of the activity took place in space, the episode nevertheless keeps from feeling too "Sam-heavy" or bogged down in action sequences. The pace was maintained by the use (some might say overuse) of news updates on the progress of the race, sponsored by Tech Con Group -- a company whose influence in society puts Microsoft to shame. There was also a colorful palate of minor characters, including Warrick's brother and the other racers, who lent additional humor and a degree of realism to the competition. What's good about this episode: It's about time that Sam got to let her hair down, figuratively speaking. Both Amanda Tapping and co-executive producer Joseph Mallozzi described this episode as doing just that, and it delivered. It was also a stroke of good judgment to use a race and characters we had already met instead of inventing another species and guest character. The small touches make the entire world of Hebridan believable. The terrific special effects are the icing on the cake ... and very tasty icing indeed. What's not so good: Just because we're getting more accustomed to the lack of Jack doesn't mean we have to be happy about it, especially in light of the deleted scene on the Sci-Fi Channel Web site, which features the all-too-often M.I.A. colonel. "Space Race" is light, humorous, and doesn't even go close to taking itself seriously, which also contrasts sharply with the last few episodes aired. It reminds us -- and perhaps the characters as well -- that saving the world needn't always be a hard, painful, treacherous task. Sometimes it can be fun, downright exciting, and still allow for room to be a good human being. With eight episodes under SG-1's Season Seven belt, each member of SG-1 has had their focus: Daniel in "Enemy Mine," Jack in "Fragile Balance," and Teal'c in "Orpheus." Each of those episodes were strong in their own ways, and I was expecting the same from the Sam-centric "Space Race." Sadly, I was disappointed. In an episode littered with caricatures, jokes that simply weren't funny, and scenes that were, quite frankly, a waste of screen time, the big saving grace was Sam herself. Major Sam Carter -- scientist, soldier, complex woman -- is a speed junkie. There have been hints to this side of her character before, but nothing substantial until now. The character insight I've been craving from Sam all season was presented on a platter. Sam was delightful. This new dimension was brimming with enthusiasm and cheek. She embraced risk, dived into a race she knew nothing about simply because it sounded exciting, and wheedled her way into getting the thrills she craved. Seeing her so relaxed as she worked with Warrick before and during the race was a welcome change to the frequently austere face she wears. Her treatment of Jarlath -- he of poor personal hygiene -- was just what I've come to expect from Sam: she was full of distaste, yet determined not to let him die. And her horrified reaction when she discovered Muirios was cheating in order to win the race was pure entertainment. This wasn't just Sam's show, though, and that was the root of my disappointment. While Warrick and his brother Eamon were interesting characters, the majority of the Hebrideans were two-dimensional and clichéd. For an alien culture, the overt Americanisms went too far. The characters' behavior, their speech patterns, their predictable dialogue, the sports commentators, and the advertising gave this alien race a distinct air of implausibility. And that brings me to the worst part of this episode. There was so much potential for a fun-filled episode liberally laced with dramatic tension that it was frustrating for the action to be repeatedly interrupted for what are surely the most irritating guest characters since Cadet Haley. I can only assume the race commentators were meant to be amusing, but they merely succeeded in diverting time from the plot, took time away from the characters that I tuned in to see, and managed to send any tension that might otherwise have built up during the race plummeting for the nearest asteroid. Even though I loved Sam, her behavior was perhaps a little too erratic. Her complaints about the cheating didn't gel with allowing Jarlath to take out Muirios' ship to ensure he wasn't victorious, especially when her experience of Jarlath should have warned her that he could as easily have destroyed the other ship rather than disable it. Her enthusiasm occasionally slipped beyond what I could accept as Carefree Carter to stumble into the realms of recklessness -- but since the episode looked so enjoyable to make, I can understand the fun slipping through into the character. Having said all that, there were some great moments between characters. Sam and Daniel's chats book-ended the episode, giving it a nice balance. Sam and Teal'c -- surely the most poorly developed relationship on the show to date -- bounced off one another beautifully; and Jack and Daniel fell into old patterns with no effort. Teal'c and Eamon, two very different personalities, also seemed to hit it off, and their interactions demonstrated once again how much Teal'c has changed over time. One other thing raised this episode from the doldrums: the special effects. Kudos to the team responsible for the spectacular race scenes -- once again they exhibited their skill and creativity to produce stunning shots of the ships twisting and turning at high speed through asteroid fields and evading the attack drones. This was an episode that didn't seem to be quite sure what it wanted to be. Was it a drama? The race was tense, but the commentators were risible. Was it a comedy? Perhaps it was meant to be, but it didn't quite make the grade. Was it a moral tale showing that bad guys don't win? Maybe, but the racist theme that reared its ugly head towards the end was out of place in a lighthearted atmosphere. Not one for repeat viewing, only Sam and the SFX drag the rating for "Space Race" up from rock-bottom. VOTE! 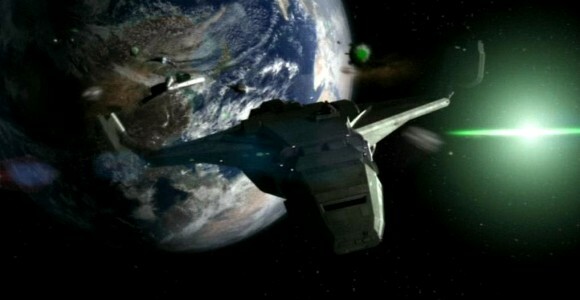 How would you rate SG-1's "Space Race?"